Duhart Milon Rothschild 2010. This large estate (190 acres) has been on a qualitative rise for nearly a decade. A classic Pauillac, the opaque purple-colored 2010, a blend of 73% Cabernet Sauvignon and 27% Merlot, reveals beautiful notes of creme de cassis, licorice, tobacco leaf and forest floor. Bigger and more muscular than most previous vintages, this full-bodied Pauillac possesses stunning density as well as intensity. Atypically high in alcohol for this property, it requires 5-7 years of cellaring and should age effortlessly for 25-30 years. 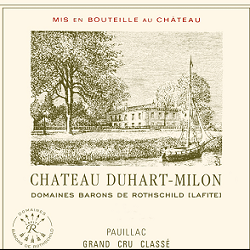 Château Duhart-Milon’s grand vin is often described as a model of the Pauillac appellation. The broker Guillaume Lawton noted as early as 1815 that it is very robust, with a fine colour, and quite pronounced sappiness (he describes the sappiness of the Médoc’s premiers crus as something like the odour given off by finest sealing wax when it is burned). The vineyard cycle began with a cold, relatively wet winter, resulting in a slightly later bud-break than in 2009, in mid-April. Growth was then boosted by dry, sunny weather in April. May and June were characterized by alternating periods of rain and sunshine. June began with a cold spell that complicated the flowering of the Merlot, resulting in flower abortion and uneven grape size. Fortunately, July was very dry (less than 20 mm of rain) with relatively high temperatures, which helped the vines to catch up from the delays caused during flowering. August and September were very dry, with beautiful daytime temperatures and cool nights creating ideal conditions for the grapes to slowly reach optimal ripeness.